Happy Monday everyone! Boy do I have a recipe to share with you today – I am in looooove with these bright Vegan Stuffed Peppers. Don’t they just exude summer and springtime? 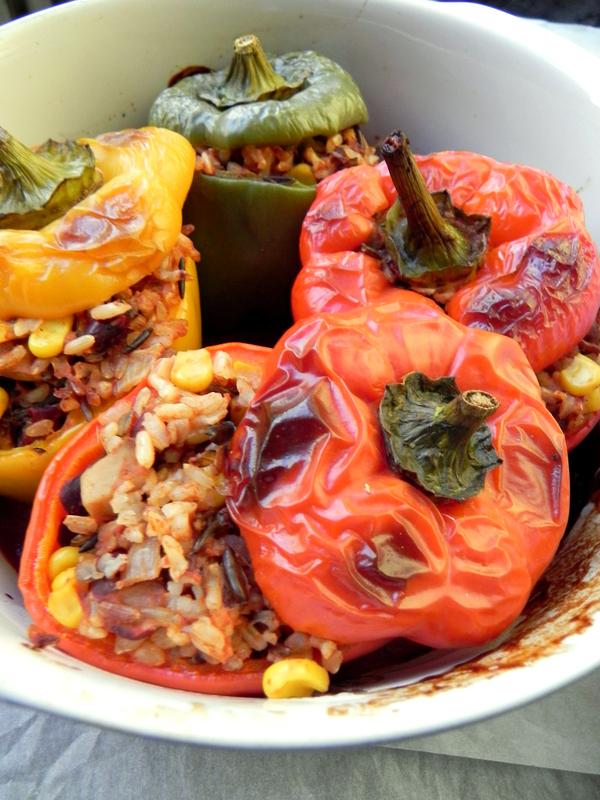 They are so comforting and healthy, these Vegan Stuffed Peppers have quickly become our new favorite meal around here. I love that they are stuffed full of so much goodness! I filled them with a creamy tomato wild rice, mushroom, bean and corn mixture! Yummayy! Are you a fan of stuffed peppers? I feel like every country has a slightly different spin on them. The stuffed peppers in Turkey are to. die. for. ahmazing! If you are ever in Turkey eat all the stuffed vegetables – you won’t regret it 😉 Whenever my family goes back to Turkey (my lovely Stepmama is Turkish so we go back there as a family often in the summer!) I am all about the stuffed vegetables. 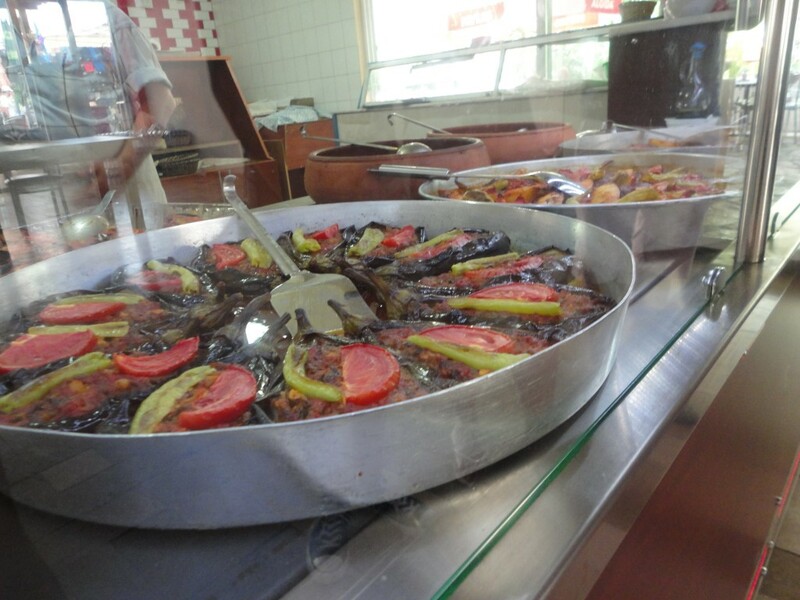 And Turkish people KNOW how to stuff vegetables just right. 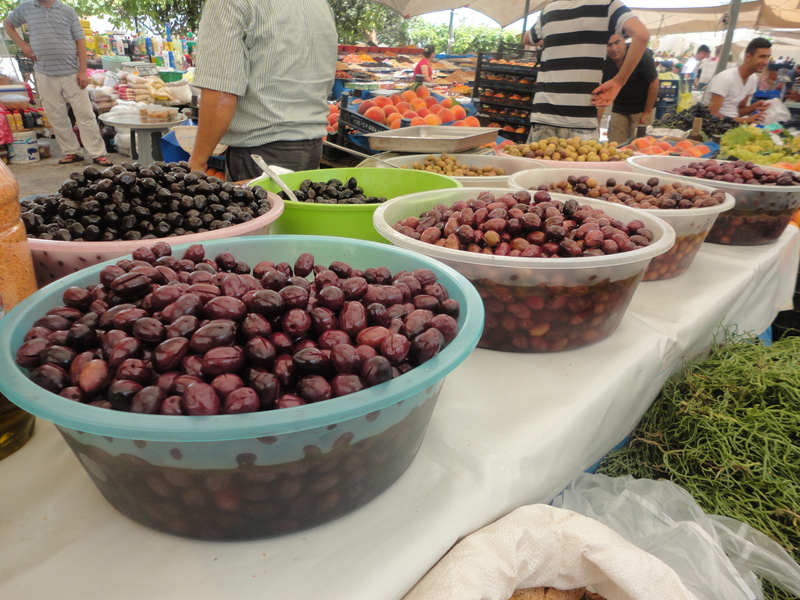 I could live off the delicious stuffed veggies, fresh olives and fruit that you can only find in this area of the world all year long. I feel like saying Vegan Stuffed Peppers is a bit of redundant because almost all of the stuffed peppers I’ve ever come across have been naturally vegan. 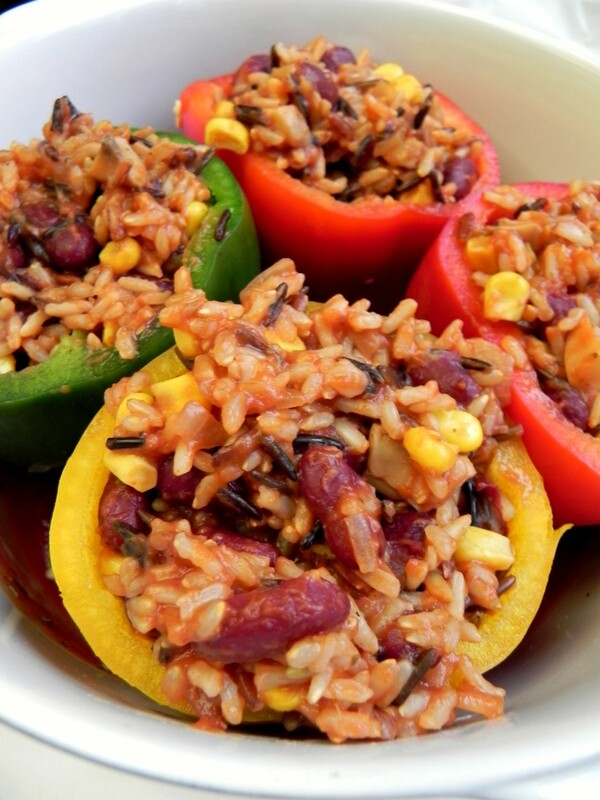 You really cannot go wrong with bright, sweet peppers stuffed with wild rice, veggies and mushrooms. I think I’m going to have to make these again this week – it’s just what I need in between the thesis I’m trying to finish and my last semester of coursework 🙂 Wishing you a wonderful week friends! 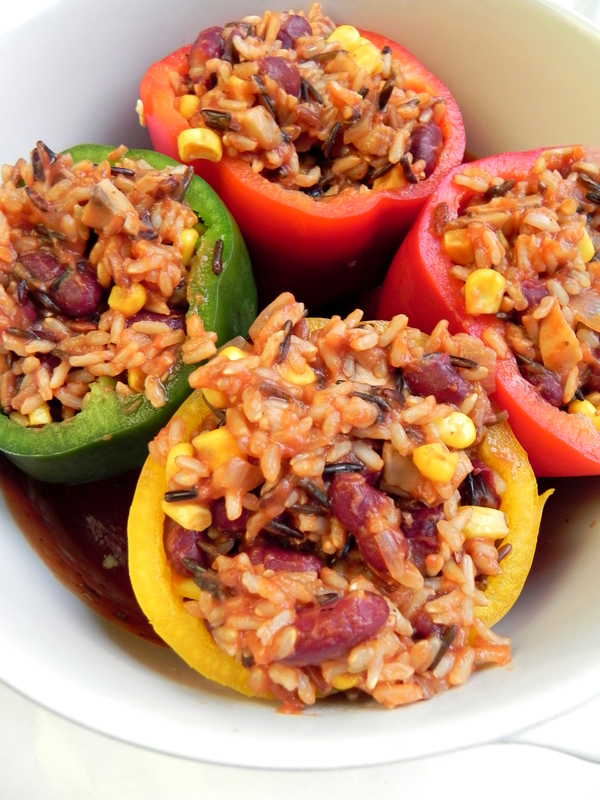 Vegan Stuffed Peppers stuffed with a hearty and filling mixture of tomatoes, wild rice, beans, vegetables and corn. A healthy, gluten free + delicious meal! Simmer wild rice on medium-low heat with vegetable broth, plain tomato sauce, herbs, mushrooms and red onion untill rice is fully cooked. When cooked, stir and mix in kidney beans and corn. Pre-heat oven to 350F/180C. When rice is cooking, prepare a casserole dish (see photo) by adding tomato sauce and spices to the bottom of the casserole dish. Prepare bell peppers by removing the seeds and white insides. Leave the tops of the pepper intact (see photo). Fill the peppers by adding the rice mixture to the peppers (you will have a bit of rice mixture left over). Arrange the stuffed peppers side by side in the pan. Cover and bake in the oven for 55 minutes. For the final 5 minutes remove the lid of the casserole dish and broil the stuffed peppers until the tops of the peppers just begins to blacken (being careful not to burn the peppers!). Smother the stuffed peppers in the thick tomato sauce from the bottom of the pan and top off with preferred garnish. Enjoy! Feel free to add any other vegetables of choice as well. You can switch up the mushrooms for eggplant, leeks, carrots or whatever you can find in your fridge. That’s the beauty of these stuffed peppers – you can customize them according to your taste-buds and what you have in your fridge. Hi Ceara! I am new to your website. I’d like to make these stuffed peppers. However, I don’t care for mushrooms. Do you think the stuffed peppers would be just as tasty if I omit the mushrooms? Of course, I may just finely dice the mushrooms and see how that works. Thank you! Hello, can I freeze these vegan stuffed peppers? I’m going to try the stuffed peppers. They look really tasty. This is my first time at your site and I’m going to take a look at the food you have. I am a true carnivore but I so enjoyed the food at your wedding, I may become a convert. This recipe is my hubby’s and my favorite meal now. I have made it about once every two weeks and use variations depending on what is in the house at the time. I think the herbs make all the difference, and I usually do not use cumin because I have so many recipes with cumin since we eat beans so much. I top with a vegan cashew sauce, sliced green onions and avocado. This is my meal for guests who aren’t used to a vegan diet because it is so hearty! Thank you for dreaming this recipe up-it is a dream come true! Yeah, I tried to make these. You don’t specify what size pot to cook the rice in or whether to cover or not while cooking. My wild rice is usually done in 25 minutes…40 minutes later, uncovered, in a large pot, still hard. Some clarification would be lovely, thanks. These tasted amazing! 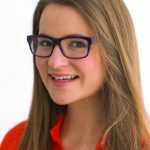 I’m newly vegan and just discovered your website. I can’t wait to try more recipes. I used to eat this growing up and I absolutely loved it. Me and my fiance switched over to the vegan lifestyle a week ago, and have been searching for tasty recipes and I think we found our new favorite website! The serving sizes was a little off (ended up with enough mix to make 10 or so) but turned out amazing. Thanks for the idea! As usual another FABULOUS recipe from Ceara!! All of my favorite vegan receipes come from your website! These stuffed peppers were really good! I made the mistake of thinking this wouldn’t be enough for the 4 of us so I increased the recipe by 50% to stuff 6 peppers and I have enough leftover to stuff at least 4 more. This was so incredibly filling! Next time I will double the sauce at the bottom of the pan because it was delicious and I love sauces! I used diced eggplant instead of mushrooms. The only problem I had was that it took forever for the rice to finish cooking. Thankfully I found that I only needed 35 minutes to bake them! Thank you for another great recipe! You have a GIFT! Oh no! I clicked on 5 stars and somehow it showed up as 1 star! I’d give 10 stars if I could! I found this recipe was just too spicy hot for me; my adult son loved them, but not for me!! I used vegan beef crumbles in stead of mushrooms and Italian seasoning in place of Herbes de Provence (I cut that in half) and even though I parboiled my peppers for five minutes (I always do this) before stuffing them, the hour of baking still left them too hard for my taste. I sprinkled vegan cheddar cheese crumbles on top the last five minutes and served them with Vegan sour cream. They were ok, but I won’t be making this recipe again. Sorry! So it was really good, but you used spicy vegan beef and that’s why you didn’t like them? Everyone else gives 5 stars, so I think I am going to give them a try! I loved this! Ended up with ~9 servings. But the stuffing was so delicious my guests just came for more. Thanks for the fabulous recipe. I loved this! Ended up with ~10 servings. But the stuffing was so delicious my guests just came for more. Thanks for the fabulous recipe. Wow… My husband s favorite meal is stuffed peppers. I definitely will cook these for him soon. Do you think Quinoa will work instead of rice? These were great but the recipe makes more like 10 servings. A half pepper was a gracious serving. I will half the recipe next time and may add some slivered almonds. I used portobello mushrooms and doubled the cooking sauce since I had to use two cooking dishes. Served with avocado and the non vegans added Parmesan. Thanks for this very tempting recipe! I also few up eating stuffed peppers, but my grandmother used hamburger and rice, onions, garlic and tomatoes. You either loved it or hahated it! I love this vegan version mostly due to the versatility! I want to create these ASAP, but I’ve never seen herbes de provence in the organic spice aisle! Please tell me what spices are in the mixture. Thanks. I know spices often make or break a tasty meal. Can I cut down on the baking time by boiling the peppers for say 5 minutes first? Thankyou for your recipe, it looks delicious! Il be making this tonight for my vegan brother. I have a question, when you say plain tomato sauce, does that imply tomato puree? Or maybe i can blanch a few tomatoes and pulp them to be added in the recipe? Hi Arif – hope you and your brother enjoy the recipe. I mean plain, canned tomato sauce. This is the brand I use here in Canada (http://www.presidentschoice.ca/en_CA/products/productlisting/pc_tomatoes_first_original_tomato_sauceprod1930127.html). Thankyou for our recipe, it looks delicious! Il be making this tonight for my vegan brother. I made the stuffing last night and I’m wondering if there is a wild rice that is light in color? My food coop sells wild rice that’s black. My filling looks very different, but it sure tastes good. I’m putting the recipe together to bake when I get home tonight. Yum! Hi Ceara! I was unaware of your blog, until the other day when I googled “vegetarian stuffed peppers” and came upon this recipe 🙂 I just made them tonight ad they are super yummy, thank you! As you stated, there is a small amount of stuffing left over, and I found one good way to eat it up (other than right out of the pot LOL). I pan fried a few corn tortillas, put the stuffing in with some cheese and sprouts. Turns out this stuffing could have many uses! Making these for my vegan sis n law on Xmas day. My stuffed pepper recipe always calls for 1/2 cup chopped dried cranberries. Loved your recipe but have to admit that I did add the cranberries. This recipe was DELICIOUS! Thank you so much for sharing, I made it tonight and my boyfriend raved about it. I did make some substitutions (sorry to be THAT reviewer lol) – I used zucchini instead of mushrooms, fresh garlic instead of powder, and brown instead of wild rice. Also, I thinly chopped some baby spinach and threw that in at the same time as the corn and beans. SO GOOD. Definitely going to be making this again and again! Hi, I found this site on a Weight Watcher pinterest board but there are no points plus for the recipes….. Going to make these tomorrow! Sometimes, I use the same filling and use zucchini.. 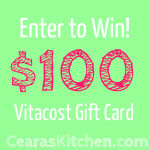 It always makes you feel not so far away when I cook from your blog! <3 Yum!!! I need to try these with Zucchini!! Let me know how they turn out! This looks delicious and healthy, I just love the colours! Stuffed peppers are so good, my kids love it, so I’m so glad that I’ve found this recipe. Thanks! Thank you so much, Miss Coconut! I hope you are your family enjoy this recipe – it’s a big hit around here! This looks so delicious and healthy. Can’t wait to grown peppers in my garden and try this recipe. Thank you so much, Ali! This is such a hearty and healthy dinner 🙂 It would certainly be delicious with fresh peppers from the garden – YUM! it looks like there is some white rice in it. Is there? There look goog! Just wild rice, Janice! No white rice. But you can really make this recipe with any rice you have on hand! 🙂 Thanks so much! I thought the same thing. The rice she linked to in her recipe does say it’s “A custom blend of wild and whole grain brown rice” – so yeah, its brown rice and some wild rice. These look so good!! You would be proud of my vegan lentil patty I ate at dinner last night!! Looks delicious, healthy and oh-so-satisfying!! Vegan Lentil Patty?! Send some my way girl!! Sounds delicious <3 Thanks so much! Oh wow,these stuffed peppers look amazing. Pinned! Thank so much for the kind words and pin, Momma Baker! Thank so much, Olivia! 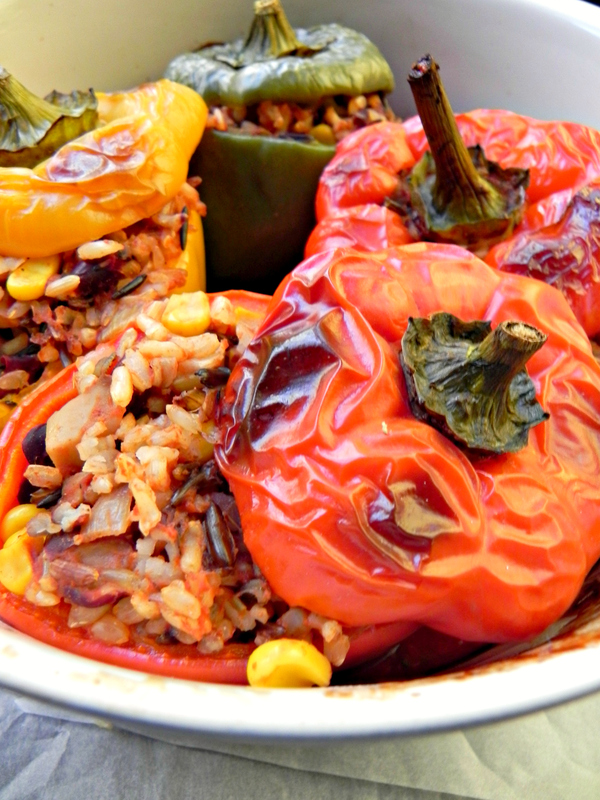 <3 These Vegan Stuffed Peppers are so delicious and hearty! Let me know if you give them a try! Hi! 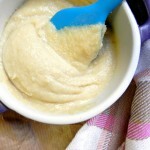 I stumbled upon this recipe and I can’t wait to try it, but could you tell me what you use as a “vegan cheese sauce”? I’m thinking maybe melted Daiya mixed with almond milk might make a sauce but I’d love to know if there’s something else! Thanks! Hi Lisa! I used leftover Vegan Cheese Sauce from my Mac + Cheese I made the night before. If you are looking for something simpler I am sure that Daiya mixed with Almond Milk or soaked cashews would be delicious! The cheese sauce isn’t mandatory though – I also enjoy these with just the thick tomato sauce from the bottom of the casserole dish! Yum! I’d love to know how your Peppers turn out! Happy Cooking! Ceara, Middle Eastern food involves a lot of stuffing – stuffed zucchini, eggplants grape leaves, tomatoes and even onions. I am so glad to see these stuffed peppers on your blog and I love the special touch of yours on this recipes! Your stuffed bell Peppers are to die for! I am just drooling!!Pinned! <3 Thank you so much, Hadia! I love all the stuffed vegetable in Middle Eastern Cooking! I need to do it more around here. One of my favorite foods is stuffed grape leaves - YUM! :) Thanks so much for the kind words and pin! Ceara, Middle Eastern food involves a lot of stuffing – stuffed zucchini, eggplants grape leaves, tomatoes and even onions. I am so glad to see these stuffed peppers on your blog and I love the special touch of yours on this recipes! Your stuffed bell Peppers are to die for! I am just drooling!! Your stuffed peppers look so bright and beautiful and are totally getting me excited for spring and summer 🙂 I adore stuffed peppers so much too, my mom used to make them for us all the time when we were younger.. Love everything you packed into these babies, they look delicious! Peppers are my favorite veggie in this world! When I was a kid mom would always add some pepper in my lunch box so that I would finish it, that’s how much I love it! And now I’m drooling looking at the pictures Ceara, so so delicious! Yum! Pinned! Oh and one other thing, the stuffed peppers I grew up eating were filled with rice and hamburger meat and were really nasty. I actually thought they all were like that. I never liked them. It wasn’t until I created my OWN version, that I now love them. It’s amazing how many different versions there are! That’s crazy!! I thought all stuffed peppers were naturally vegan most of the time! I heard that the addition of meat was just a special occasion thing (at least in the Mediterranean). I prefer our veggie versions anyways 😉 I love how versatile Stuffed Peppers are too! Oh Ceara, these are right up my alley! This is why I love your blog, simple ingredients and you use the same kind of ingredients I love…not a bunch of weird stuff. These look heavenly. I have a stuffed pepper recipe on my blog too and of course they contain my favorie food, potatoes, lol! Mine also have zucchini, garlic, onion, jalapenos and several spices. It is one of my very first recipes I ever posted, so the pic is horrible. This is reminding me I need to remake them and update with some nice photos! I haven’t made them in so long. Anyways, I love your tomato sauce for these too! I’m so happy that you like the Stuffed Peppers, Brandi!! I’m all about the simple ingredients as you know – rice, beans, potatoes and veggies are my jam! 🙂 Your stuffed peppers with potatoes sound DELICIOUS! I will have to make those next time! Yum! These look great. I know what you mean about nostalgic, too. These remind me of eating them as a kid, but I think we had meat in them. I’m pretty sure I preferred just the rice and veggies that were in them even then! I love the idea of making this into a St. Patty’s day meal with green peppers! What a fun idea, Meghan! <3 Thanks!! Love stuffed peppers and make them very often! And this Turkish recipe is very similar to what my grandma makes in Bulgaria! Pinned to try it soon! <3 I love that this recipe is similar to the one your grandma used to make in Bulgaria - grandma's recipes are always the best :) Thanks for the kind words and pin, Mira! These look so delicious! I love stuffed peppers as there is so much that you can do with them. They are also really filling too. Sharing this on twitter! Thanks so much for the share my friend!!!! <3 I love how versatile stuffed peppers are too!! So, so pretty, Ceara! Love the pics and love stuffed peppers, too. LIke your addition of herbs de provence here. That would be an interesting spice to add. I will have to do that next time. Thank you so much, Lori!! 🙂 I love herbes de provence – it’s such a versatile spice! I love that it’s a whole bunch of herbes in one! Makes things a lot easier in the kitchen! 🙂 Let me know if you end up trying these – they are delicious! This dish definitely screams spring, Ceara! I love it! Stuffed peppers are so good, though I never think to make them. I definitely need to change that after seeing this dish! I love the mushrooms and kindey beans in here. Sounds delicious! Pinned! Hope you have a great Monday! I’ve been craving stuffed peppers for a few months now. My mom refuses to make them because she claims that they always come out too dry when she makes them. I’ll have to make these for her and then share the recipe. I love this. All of those olives in the picture above make my mouth water. These are SO moist and delicious, Erin! Not a dry piece of rice in sight! Initially cooking the rice in tomato sauce and veggie broth plus the tomato sauce at the bottom of the casserole dish helps with that! 😀 I hope you enjoy these if you end up making them!! Thank you!